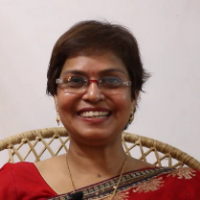 Mondreeta Sengupta is attached to the Ministry of Tourism since 2006 and is a Cultural and Spiritual Ambassador to foreign delegates and the founder of Adventoure. An ex-GM (HR) of Reliance Industries Ltd, a faculty with training wing of American Consulate and with Airlines & Aviation Industry, she has been nurturing development and growth of Human Relations and Life Management Skills for past two decades. She is a qualified Accountant, Psychologist, Psychotherapist and Trainer. She has authored a few National Award winning travelogues to share her travelling experiences. She is a Nature Photographer and a freelance Journalist. She is a recognized sports person and has excelled in Swimming and Mountaineering. She is a versatile and an innovative International speaker, trainer and has been training at different Educational Institutions including IITTM. She is the Trustee of World Pranic Healing & Training Centre, Dehradun and has been conducting health and wellness workshops since 1996. In Health & Wellness the mission is to promote and nurture a community of care supportive of healthy life long personal and relational behaviors. "An ex-GM (HR) of Reliance Industries Ltd, a faculty with training wing of American Consulate and with Airlines & Aviation Industry, I have been nurturing development and growth of Human Relations and Life Management Skills for past two decades. I am the trustee at World Pranic Healing & Training Centre, Dehradun and have been conducting health and wellness workshops since 1996." Training and development can be described as an educational process which involves the sharpening of skills, concepts, changing of attitude and gaining more knowledge to enhance the performance of employees. "An ex-GM (HR) of Reliance Industries Ltd, a faculty with training wing of American Consulate and with Airlines & Aviation Industry, I have been nurturing development and growth of Human Relations and Life Management Skills for past two decades."